A team representing the Social Fund for Development of the Ministry of Planning, the province of Dohuk in the Kurdistan region as one of the three provinces covered by the support of the Fund, in addition to the provinces of Muthanna and Salahuddin. The delegation met with the head of the Fund's branch in Dohuk governorate, Mr. Hawar Taher Sulaiman and the employees of the branch, in the presence of World Bank representatives. During the meeting, they discussed and discussed a number of issues related to the work mechanisms of the Fund according to the work teams at headquarters and how to link the work between the Center and the Region Ensuring the implementation of projects proposed by communities in villages and areas covered by UNFPA support. The visit of the team to the province of Dohuk conducted a field tour in a number of villages covered by support, which are located at a distance from the center of the province, as well as rough roads leading to it .. The team met during the tour of the choirs and elders and dignitaries and the children of those villages, and heard from them to a detailed explanation of The nature of the procedures adopted in the selection of projects and the identification of priorities and importance for each project. For their part, the children of these villages welcomed the visit of the Social Fund for Development (SFD) working team, expressing their great desire to provide services to their areas, praising at the same time the transparency of procedures and mechanisms adopted in the selection of projects, explaining that the choice was through direct voting. The selection was expressed in real terms of the need for their areas, especially projects paving roads or establish drinking water projects or expand and build new schools and provide primary health services for the people of remote villages .. Stressing their support and strong support to the teams and the work that will take place Implementation of projects, because they are in their interest class basis, calling for speeding up the implementation of projects to start in order to strengthen trust with local communities. 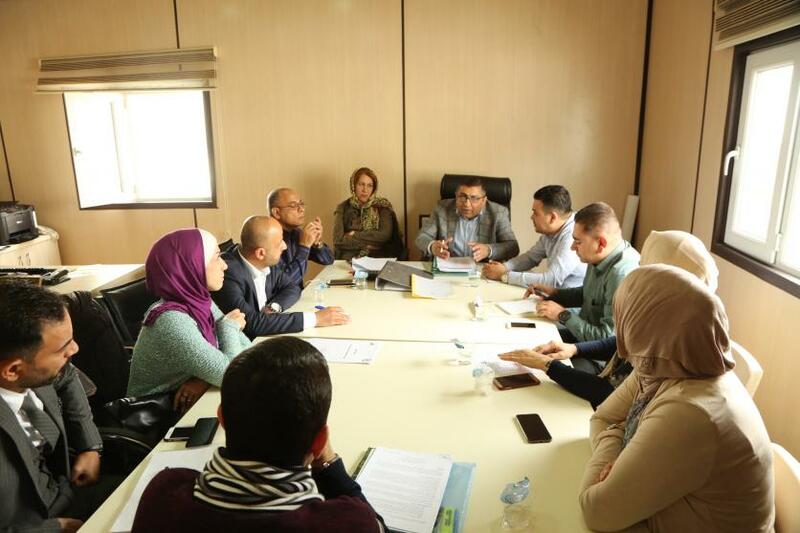 During the field tour attended by the head and members of the Fund's branch in Duhok governorate, the SFD team reviewed the size of the proposed projects and the level of services that will be provided to the children of the villages supported. On the other hand, following the field tour, the Social Fund for Development (SFD) team held an extensive meeting with the head and members of the Fund's branch in Dohuk governorate, attended by Eng. Abbas Fadhel Abbas, Assistant Director General of Sector Planning Department, Head of Supply Team at the Fund and the official spokesman of the Ministry of Planning Abdul Zahra Al Hindawi. Mr. Rashad Saleh, Account Manager, Chief Financial Officer, Mr. Haidar Salah Zainal, Head of the Follow-up Team, Mr. Hossam Abdulraza from the Grievance Processing Team, Mr. Mustafa Khalid Ahmed, Head of the Environment Team, Mr. Mohammed Salman from the Procurement Team and Ms. Heba Salem from The financial team and Mr. Alaa Hashim from the communication team. The participants in the meeting discussed the mechanisms of announcing the projects through the fund in all stages including (advertising, closing, opening, analysis, referral) according to the standard documents issued by the Ministry of Planning. The media plan and the definition of projects and the role of the Ministry of Planning in this project, and emphasizing the need to know the local communities, the implementation of projects will be by the Iraqi government through the Social Fund for Development of the Ministry of Federal Planning, Duke through a loan from the World Bank for Iraq, the Fund will be financially and administratively independent after the issuance of its own law. The meeting also discussed the role of the follow-up team in the process of selection and implementation of projects through the proposed mechanisms in this area, as well as emphasis on the environmental aspect and measures taken in addressing the potential environmental impacts of the projects. The two sides discussed the issue of grievances and mechanisms for receiving complaints and proposals submitted by the local community, Through the publication of posters in the areas covered by the phone numbers and addresses of the concerned parties, to be classified complaints and grievances and their paths and the establishment of time limits to address by type, class and weight. During the meeting, it was agreed that the work requirements will be completed in the coming weeks. The project will then be announced in the direction of the announcement of projects approved by the local community and approved by the Social Fund for Development. On the other hand, the Chairman and members of the Duhok branch, expressed their high appreciation of the visit of the team to their province and to see the reality of work on the ground and the development of solutions and solutions to the problems in the work, stressing that they will implement all the instructions and controls for the implementation of projects implemented by the Fund. It should be noted that about 40 villages were covered by the Social Fund for Development in the first phase of its work in 2018, distributed in three governorates, and 20 villages in Muthanna governorate as the poorest governorate among all the governorates of Iraq, 10 villages in Salah ad Din province and 10 In the governorate of Duhok. It is hoped that other governorates will be covered during the current year. All governorates will be covered during the coming year 2020 according to the inclusion criteria, which comes first and foremost the multi-dimensional poverty criterion according to the results of the rural villages survey carried out by the Ministry of Planning. The Social Fund for Development, established in 2016 by the Council of Ministers, is an integrated development institution aimed at economic empowerment, improving living standards, reducing unemployment, providing highly qualified human resources and supporting small enterprises. The Ministry of Planning has already announced that the Social Fund for Development (SFD) will receive a loan from the World Bank worth $ 300 million. The Fund will work in two phases, the first of which is the foundation stage. The responsibility will be the responsibility of the Ministry of Planning through the executive management of the poverty alleviation strategy.